It's a quadrennial issue. Every presidential election finds college students wading through a swamp of murky laws and logistical hurdles to get into the polling booths. But this year, amid students' record interest  and record primary turnout  experts say many campus precincts are sorely unprepared to meet student demand. And laws passed after the 2004 election, ostensibly to clamp down on voter fraud, could cause a slew of new problems that disproportionately hit student voters. Which means the question in 2008 isn't whether young voters deliver. "It's can the young voters deliver?" says Matthew Segal, executive director of the Student Association for Voter Empowerment. The most glaring problems come from lack of preparation. Segal fears not much has changed since his experience as a freshman at Kenyon College in 2004, during the closely contested Ohio race. He manned the 10-hour polling lines on campus, dispensing water, pizza and umbrellas to the stalwarts who stuck around in the rain to cast their votes. To him, the inadequate planning was obvious: registration had surged since 2000, he notes, but the campus precinct had been allocated no additional voting machines. That left two machines for 1,300 voters. "The media angle was, Aren't these young kids heroic to have stood in line all day?" he says. "Rather than, There's something inherently wrong in the first place." Kenyon has now upped its number of voting machines to 10, but other precincts admit they're still basing their Election Day plans on where the voting rolls stood in August, long before student-voter drives even started, let alone achieved record successes. To accommodate the swollen voting rolls, many understaffed offices will have to hire temps or new employees who are less familiar with standard procedures and may be more prone to making mistakes. Because local officials have wide latitude in interpreting election laws that vary from state to state, misunderstandings  or misinformation  could have an even greater impact this year than in 2004, given the anticipated bulge in student turnout. Most of the trouble comes from nailing down where college students should be counted as residents if they attend school in one state but go home to another during the holidays. The Supreme Court's position is clear: a 1979 ruling found that all students have the right to vote where they attend college. But local officials often make students travel a rocky road. In recent months, registrars in counties including Montgomery, Va. (home to Virginia Tech), Greenville, S.C. (Furman University), and most recently El Paso, Colo. (Colorado College), issued warnings that were off-putting if not outright alarming: students who register in their college town could be ineligible to be claimed as dependents on their parents' tax returns and might be in danger of losing tuition scholarships. The problem, according to youth-voter advocates and the IRS, was that these dire warnings were incorrect. After widespread outrage, the registrars backed off. But experts worry that the resulting confusion could sour first timers on voting altogether. "It's creating somewhat of a chilling effect," says Steve Fenberg, executive director of the youth civic action group New Era Colorado. Legal misunderstandings are one thing, but some registrars seem to make political decisions about whether students get to vote locally. In Virginia, for example, where the law stipulates that voters must establish "domicile" in their precincts to register but never defines that term, youth-voter advocates say it's no accident that registrars' rulings are often strictest in small towns, where students could potentially swing a local election. In 2004, after a voter drive registered 2,000 William and Mary students in Williamsburg  home to fewer than 12,000 residents  the local registrar announced that students no longer had domicile and could not vote there. "If you're a homeless person, you're allowed to write down the landmarks that you live around," says Zach Pilchen, president of College Democrats at William and Mary, pointing to a space on Virginia's form reserved for that purpose. "But you can't register from a dormitory." Win Sowder, who took over as Williamsburg's registrar in 2007, says her office no longer asks about domicile or restricts student voting. Ironically, since the last presidential election, several states that have passed laws intended to restore public confidence in the election process could end up excluding a lot of first-time student voters. 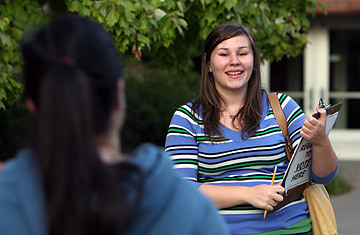 Last May, for example, during Indiana's Democratic primary, Melanie Meentz, now 19, arrived as a freshman at the polling place at St. Mary's College with what seemed like documents aplenty: her approved voter registration card for St. Joseph County, where St. Mary's is located, along with her school photo ID, Social Security card and driver's license from Illinois, where she grew up. But under a 2005 Indiana law  upheld last April in a Supreme Court decision that has rankled voter advocates more than any other case since Bush v. Gore  Meentz was refused a ballot because she did not have an in-state ID. And without so much as an explanation of her options, like a provisional or absentee ballot, poll workers sent her home. "That would have been the first time that I would have voted," says Meentz. "I'm still upset about it." Strict ID laws passed since 2004  including one that prompted the U.S. Student Association and the ACLU to sue top officials in Michigan on Sept. 18; one the Department of Justice has challenged in Georgia; and similar statutes in Arizona and Florida  fall harder on students than on most voters because so many study out of state. A Rock the Vote poll in February found that 19% of people ages 18-30 don't have a government ID that reflects their current address. And while some states like Ohio will accept alternative ID in the form of a utility bill, producing one can be a tall order for students, who tend to live in dorms and whose utility costs are folded into board fees. The president of Oberlin has issued utility bills for zero payment to all students to allow them to fulfill local residency requirements, and he is urging other schools to do the same. But elsewhere, many students are stuck. Youth advocates say they will focus on putting out fires until after Election Day. Once the hyper-partisanship has ebbed, they will start a more aggressive push  kicked off by a hearing in front of the House Administration Committee on Sept. 25  for their long-term legislative goals, which include facilitating student-voter registration both on Election Day and far in advance of it through high school civics classes, as well as more consistent guidelines to help registrars do their jobs and ensure that students get to vote. Says Sujatha Jahagirdar, program director of the Student Public Interest Research Group's New Voters Project: "It's a civil rights issue." For now, some young voters are left feeling that in the election meant to be their civic coming-out party, whether or not they can make themselves heard is out of their control. Pilchen recalls watching Defense Secretary Robert Gates give a speech at William and Mary in 2007, when students were still licking their wounds from the domicile controversy. "He was expressing outrage about the fact that so many young people don't vote," Pilchen recalls. "Students were trying to vote forever, and they were just being blocked at every turn."